At this time of the year it’s tough for me to photograph birds—often when I spot them, they are mostly hidden in the foliage. 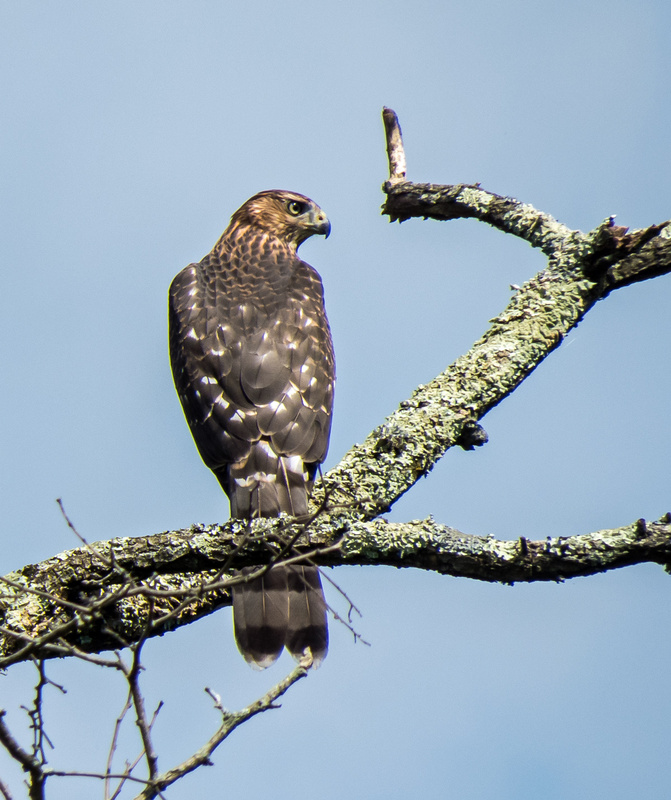 This hawk, however, cooperated by perching out in the open this past Saturday at Jackson Miles Abbott Wetland Refuge. I was uncertain about the identification, so I checked with the experts in several Facebook birding groups and they indicated that this is an immature Cooper’s Hawk (Accipiter cooperii). Cooper’s Hawks belong to the group of hawks called accipiters, also known as bird hawks. Accipiters have short rounded wings and a long tail and are better adapted to hunting in the woodlands that most other hawks. Great composition of this beautiful hawk and the lichen covered branch, Mike! I read about hawks who hunt in the woods, and I just have to laugh. If there wasn’t a marked trail, I’d either be lost forever or I’d run into a tree, and these guys fly though at speeds I can’t manage in an open field. Beautiful capture of a magnificent bird, Mike. He may be immature, but he looks ready to get down to business. This is a really striking portrait. I love the composition and the visual textures as well as the lovely detail on the bird. Thanks, Laura. The bird gets most of the credit for the composition, although I did maneuver around a little to change the angle of view. I was particularly happy to capture as much texture as I did in the wings and on the branches. Thanks. I took the shot from a pretty good distance away, so I wasn’t sure how it would come out in terms of sharpness and composition.